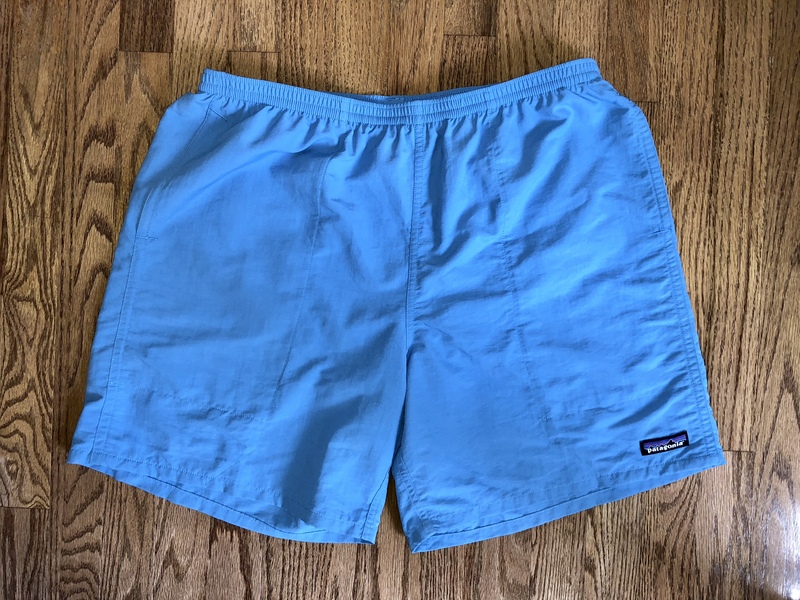 After the fuzzy pullover fleece, the most ionic Patagonia item is probably their Baggies shorts. This will be my second summer with my pair of Baggies Longs, and they have become my go-to shorts for lounging round the house, taking the dog for a walk, and hanging around outside. My shorts are from before this season when they switched to recycled nylon, but other than that, they are identical to the current model of the shorts. The fabric is 100% SUPPLEX nylon (SUPPLEX is a brand of nylon made with smaller fibers to make the fabric softer and more water resistant). There is also a DWR finish applied to the fabric to help even further with the water resistance. I find the fabric to be very soft and comfortable. It also has noticeably less “nylon” sound when walking. This may be that they are shorts, but I have worn some other nylon shorts that make more noise. The water resistance/DWR make these great for outdoor activities as they resist splashes/rain and when they do get wet they dry quickly. Since these shorts have an elastic waistband with an internal drawstring, they come in S-XXL sizing. I found the size chart from Patagonia to be accurate. For me, the 7” inseam of the Longs is perfect, but the regular version of the shorts has a 5” inseam. The bagginess of the shorts is a perfect balance of comfort while not looking too casual (I think they look better than a pair of traditional athletic shorts). The bagginess of the shorts helps make sure they never get in the way and restrict your movement. This makes them ideal for activities like weight lifting, hiking, walking, etc., but I would not want to wear them for activities like running, rowing, etc. as the extra fabric could get in the way. 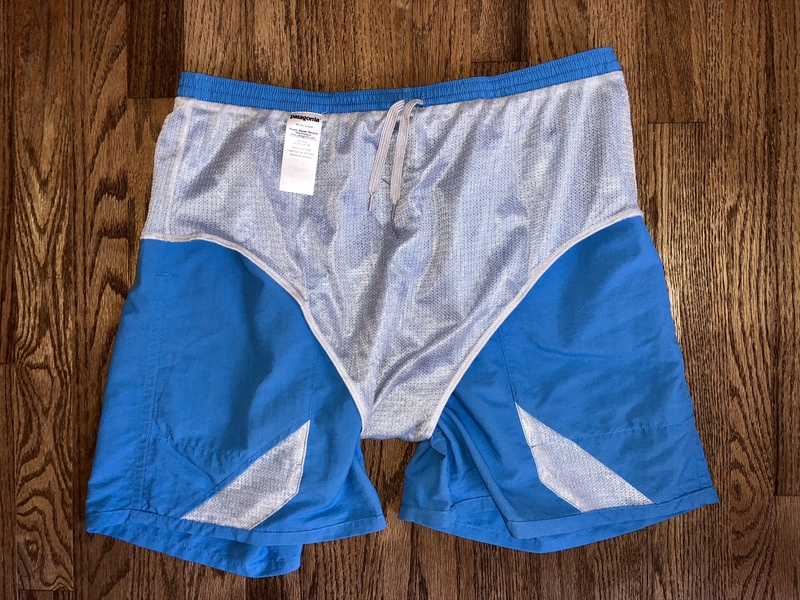 The mesh liner also makes these shorts appropriate for swimming and other water sports — no need to pack a separate pair of swim trunks. 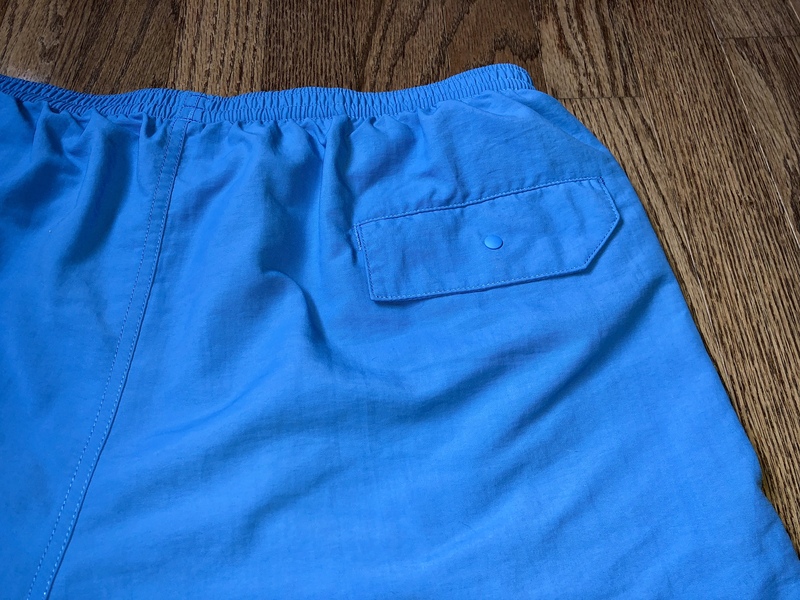 The front pockets are fully attached to the legs of the shorts preventing them from flopping around when they are full. They are mostly made with the same material as the shorts with a mesh panel at the bottom for water drainage. While nice and deep, I find the vertical construction of the pocket slightly problematic. On some occasions when sitting with my phone in my pocket I found it trying to slide back out. There is also one good sized back pocket with a snap closure. The elastic in the waistband is comfortable, never cutting or pinching, and the drawstring is flat and holds a knot well. These shorts are one of my favorite pairs. I still grab my Myles Apparel Momentum Short 2.0 for exercise, but the Baggies Long are my go-to for all other casual summer wear. With the exception of the pocket angle, these are perfect shorts to serve your (very) casual summer needs.